A lot of old school people will swear by HPS (High-Pressure Sodium) lights for flowering. They are known to produce the best yield, but come with a few negatives. Particularly, they get flipping hot! They require a duct to filter away all that heat. As it gets hot as balls in Australia, these lights could also prove to be a fire risk. It’s much easier to manage a garden when heat isn’t as much of an issue, at least in my opinion! So, where does this leave us? LED Lights. There’s a huge range, with differences in price, spectrum and wattage. We’ve fallen in love with HLG lights. Particularly the HLG 260W Quantum Board. It’s not cheap, but boy oh boy are they efficient. With only 260 watts of power, they claim to be the equivalent to HPS lights at 550-600w. Would I say this is true? Probably not quite, at least in my limited experience thus far. They’re probably closer to 450-500w. How do I figure that? Well, I’ve taken a look at many grows using HPS lights and what their yield is. Generally, their goal is at least a gram per 1 watt, if not a lot more. Often, however, beginners may get closer to 0.5-0.8g per watt with HPS lights. The HLG 260W yielded 10 ounces (280g) for me. They flowered for 8 weeks in a pretty small tent. With a bit more room, they could have easily produced more. That works out to over a gram per watt! The next time, with a bit more training, I produced 14 ounces (392g). That’s pretty incredible for only 260w of energy! What makes the HLG 260W quantum board so special, in my opinion? The fact that all it uses to cool down is a flat heatsink. No fans, nothing. It stays very cool; which helps, as the plants can grow a little closer to LED’s than a traditional HPS light. Metal Halide lights are what you would typically use during the vegetative state of growing your cannabis. They produce a light blueish light spectrum, which is what plants like when they are in their earlier stages. 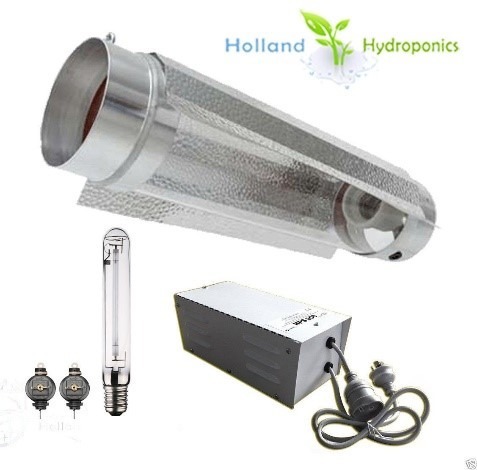 HPS grow lights are the stock standard for when your plants in the flowering stage. They produce a yellow light, which enhances bud production and produces great yields! These are some of the most efficient lights available today, which is what makes them so popular. They do run very hot, though, and need an exhaust to run through their reflective hood to stay cool. 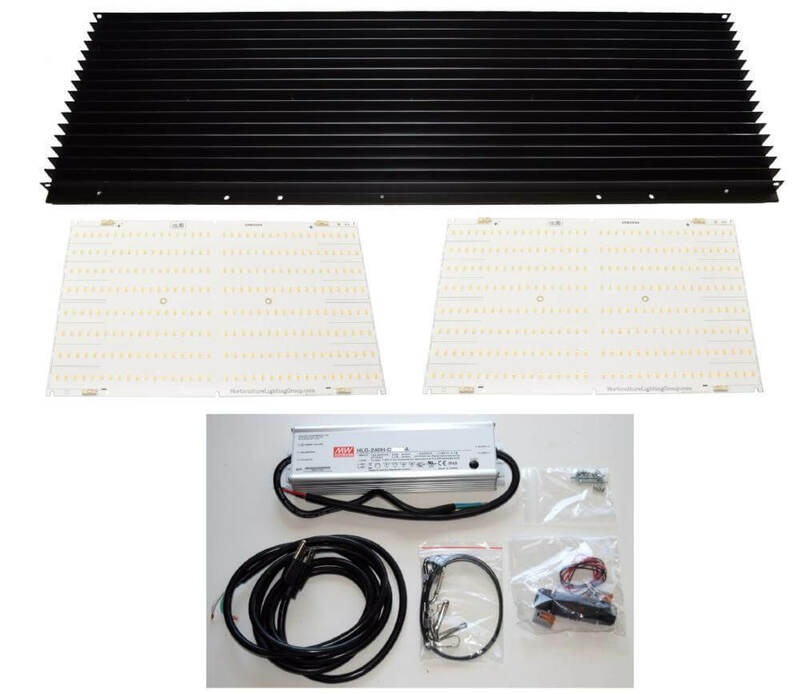 You can pick up a 600w HPS light with a hood and ballast (which powers the light) for only $140 on eBay! These lights need to be kept a fair distance away from your plants, so ensure your grow tent is at least 1.5m tall! They also contain bulbs, which will die over time. Expect to replace the bulbs every year or so. LED grow lights are what we recommend, 100%. Yields might be slightly less than a HPS light, however the lower temperature, combined with savings in electricity, make it a much easier to manage a grow! Another huge advantage of LED lights is that they will last a LOT longer than HPS lights. We strongly recommend investing in some high quality LED lights. Think of them as a long term investment. Commonly recommended LED lights include the “burple” (blue and red lights), which are quite cheap. Viparspectra is a renowned brand. They range from 300W to 1200W. 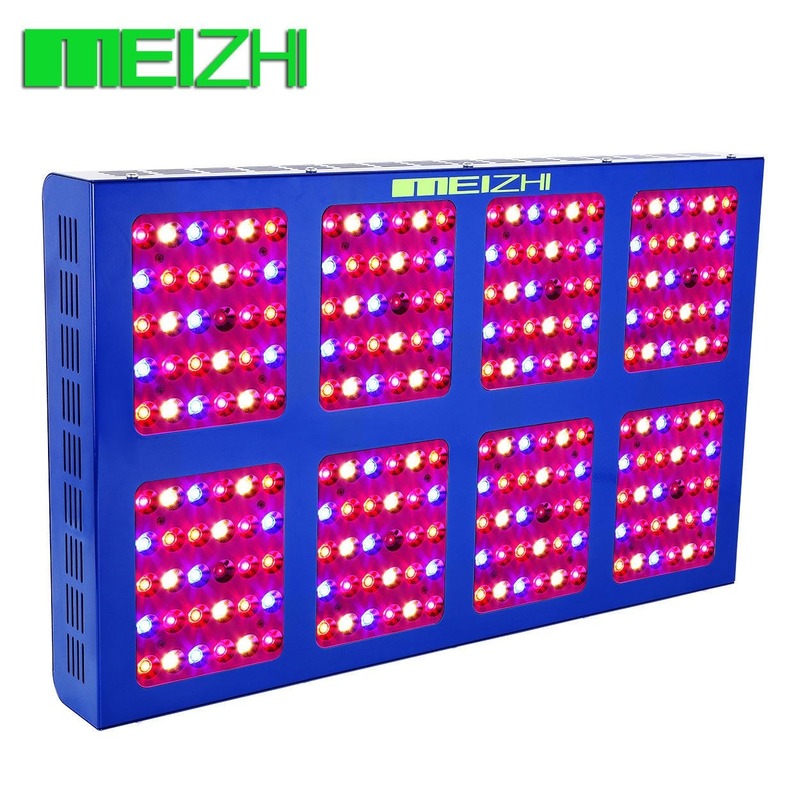 There are also Meizhi lights, which cost around $400 on eBay for a 700W. However, this light is not the equivalent of a 600W HPS light whatsoever. Its actual power draw is only 269W. They are a little deceptive, when it comes to how good they really are. They also run fairly hot, and have fans built in to help them cool down. This is why we do not recommend the burple lights, they claim one thing in their marketing and provide another. But alas, not all is lost for LED’s! We STRONGLY recommend the Horticulture Lighting Group (HLG) LED lights. 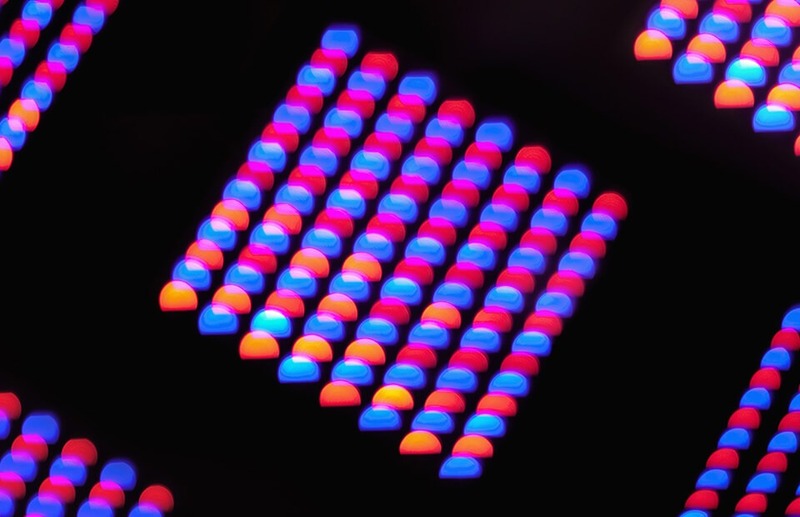 These lights use a Samsung Quantum LED board, which allows for the use of highly efficient LED lights that actually provide the wattage they state on the label. You can use the code “hlg55075” for a $75 discount on the HLG 550W light! And you can use the code “hlg26015” for a $15 discount on the HLG 260W! You can take a look at the youtube video below that compares the HLG 65 to the Viparspectra 300 and you’ll see the results are the same. The Viparspectra uses around 136W of power and gets only slightly better than the HLG 65 Watt light. They have a few mainboards, the 550W V2 ($1400 USD), 260W V2 ($330 USD) and the 320W V2 ($457 USD), as well as a few other sizes. You might be thinking, HOLY CRAP THAT’S EXPENSIVE. And you would be correct, but let FAB explain to you why you want to strongly consider these lights. Efficiency. These lights use the exact amount of power that they say they do, and are bloody strong and powerful grow lights. Why is this important? Your electricity bill! We have created a tool to calculate your electricity usage (see at the end of the article) for when you grow in Australia. It’s important to know that if you can replace a 600w HPS light with a 320W LED light, you’d be saving a lot of money on your electricity bill… after just a few grows, these lights manage to pay themselves off. They also run very cool, with only a heatsink to cool them down – which is all that’s needed, plus an exhaust fan. They won’t get anywhere near as hot as Burple LED’s and HPS lights. The lights are also dimmable, so if they are too strong or hot, you can lower their power draw. Additionally, since they only have a heatsink, they take up less space in your grow tent. You can purchase these lights directly from HLG in the US. They DHL courier to Australia within a week. But you can also talk to Quick Bloom Lights, which is Australia’s distributor for HLG lights. It’s worth having a look at the conversion costs between the two sites. It may work out cheaper to buy them from the United States. However, know that you’ll have to adapt the power cable (a little bit of rewiring). Quick Bloom Lights are also good to chat to, as they do consider dropping the price if you just have a chat to them. They’re a good group of folks! When you pick your light, you’ll have two options when it comes to what spectrum you want them to run at – 3000k or 4000k. 4000k is ideal for vegetation, and 3000k for flowering. However, if you only want to purchase one light (which is the smarter option) just grab a 3000k and you’ll be sweet. The appropriate size of your light depends entirely on your grow tent size. If you are growing in a tent that is around 90cm x 90cm, you should look to grab a 400W HPS light or a 700W-900W Burple LED light. You could also grab a 300-320W HLG light. If you are growing in a tent that is approx. 1.2m x 1.2m, you could grab yourself a 600W HPS light and at least a 900W burple LED light. Additionally, a 550W HLG light will blow you away with its sizeable yields! You can check the light specifications for their recommended growing footprint on their respective websites. Often look for what they recommend for the flowering stage and not the vegetative stage. If you have an odd shaped tent or are just unsure, feel free to leave a comment or send a message through our contact form or Facebook. We’ll try to help you out. That entirely depends on what stage your plant is at, along with its unique genetics. For photoperiod (i.e: normal) cannabis plants, you want to provide them 18 hours of light when they start growing. This is known as the vegetative phase; it is meant to simulate the plants. It is a simulation of the sun being out in Spring and Summer, the longest periods of light in the year. Then you have the flowering phase. this is when your plant starts to produce buds and begins moving towards its impending death. During this period, you want to provide 12 hours of light to your specimens. This simulates Autumn going into Winter. With shorter days, the plant will begin to reproduce such that it may survive again the next season. Something to add is knowing when to change your growing cycle from vegetative to flowering states. This depends on how big your tent is, how big you want your plants to grow, as well as their genetic properties. For Sativas, you will want to flip them into flowering rather quickly. Also, make sure you have a tall tent for the old mother! Flip your plants when they’re about 1/3 of the height of their final form. Sativas grow 100-150% taller in their flowering phase, taking between 2 and 3 weeks. 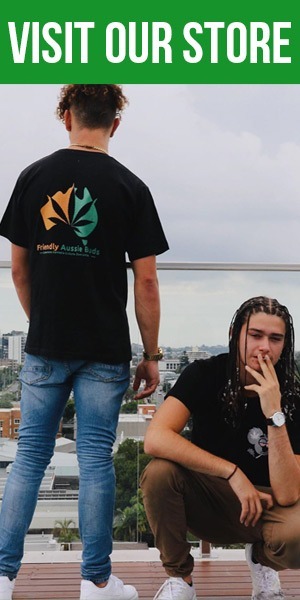 If they are Indicas, you can let them get 30-50% taller before flipping. With regards to Hybrid strains, you will need to look up their makeup, as well as research how large they grow. 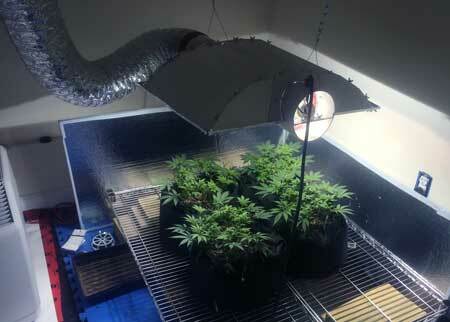 If you have Auto-flowering plants, they can receive any amount of light you give them. They will flower regardless around the three-week mark. We suggest giving your auto-flowers 20 hours of light per day. Remember to never let your plants get closer than 30cm to your grow light! How do I Ensure my Lights Run When I Need Them To? Thankfully, you don’t have to manually turn your lights on and off every 12/18 hours. 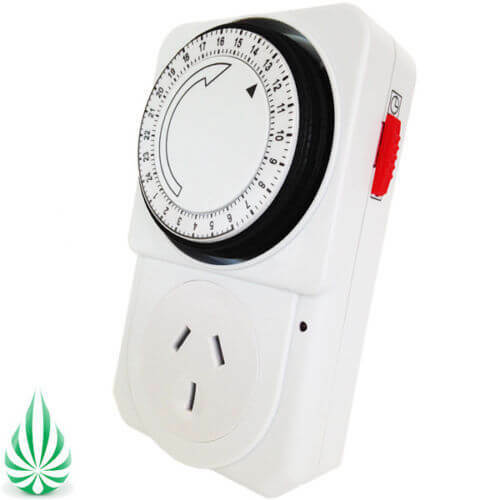 You will just need an electrical switch timer! These are about $15 on eBay. They work incredibly well at turning on appliances when they need to be turned on. It’s simple; just push down the little tabs for the hours you want your light to be on. These are a must buy item for all growers. It will make your life a lot easier, trust me. Take a look at the difference in cost between the HLG 260W and a Viparspectra 900W (About equivalent results). The price difference is around $29 per grow! So around $100 a year! Think long term when deciding on your lights! That sums up most of what you need to know about lights. To get a better idea of how to grow cannabis indoors, check out our main article here. Additionally, if you want to understand lights to a deeper level, give Grow Weed Easy a look. 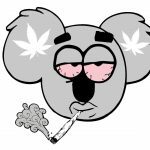 A Guide for Growing Cannabis Indoors in Australia…when it’s legal. Very interesting the cost variables between HPS and LED. So informative so much has changed in the last few years.